Before air-conditioning, as the low country summer heat and humidity descended upon coastal Savannah, residents who were able headed up to summer homes in the cool high country of North Carolina. It’s different today. 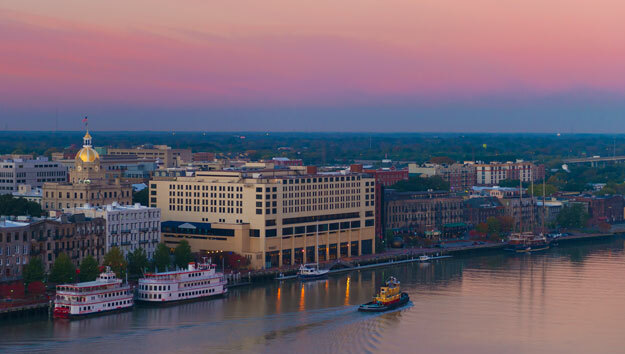 Savannah, with its astounding historic heritage, collection of house museums and intriguing coastline, is a fascinating and fun place to visit in the summer. The weather hasn’t changed – it’s still hot and humid – but there are ways to beat the heat. Stay cool in air-conditioned comfort of interesting indoor venues and embrace the outdoors with memorable adventures on the river and along Georgia’s unique marsh-laced coastline. Either way, it’s a wonderful time! Savannah is best known for its beautifully restored, architecturally significant, grand historic homes, many open to the public for house tours. All are air-conditioned! Filled with the finest collections of lavish period furnishings, art, silver, crystal, porcelain, these gracious homes provide insight into life in 19th century Savannah, a period of considerable opulence, when cotton was king. Each one is an architectural treasure. These mid-1800 homes are grandly opulent: Italianate Andrew Low House on Lafayette Square; Gothic Revival Green-Meldrim House; Mercer-Williams House on Bull St.; Harper Fowlkes House, childhood home of Southern Gothic writer, Flannery O’Connor. Earlier 1819 Owens-Thomas House is a fine example of elegant English Regency as well as elegantly austere 1820 Federal period along with the 1896 late Victorian smaller King- Tisdell Cottage, dedicated to the preservation of African American history and culture, provide fascinating bookends to this important span of Savannah’s history. In a city steeped in history, where exquisite art of older eras fill House Museums and Telfair Academy, Savannah’s love of modern and contemporary provides a dramatic change in visual experiences. Jepson Center for the Arts, with its impressive modern art collection and interactive gallery for children, ArtZeum, and the avant-garde art coming out of SCAD, Savannah College of Art & Design on exhibit at the must see SCAD Museum of Art, are stunning. 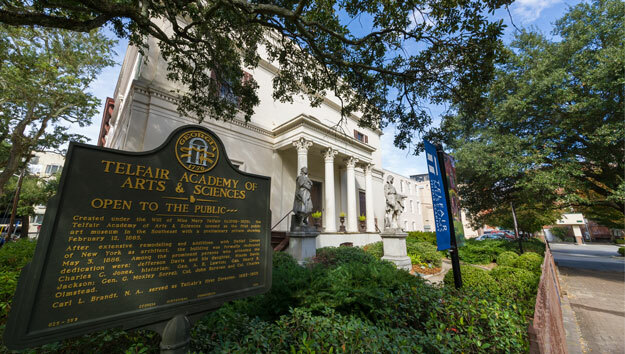 Numerous art galleries exhibit works by some of the best artists and artisans who call Savannah home. For art unique to coastal Georgia, check out the Gullah-Geechee handcrafted jewelry, metalwork and sweetgrass baskets at Samantha Claar’s Gullah Living in City Market. Or watch the women who hold and use old traditions to weave sweetgrass baskets in City Market. Did you know that Savannah is home to the only Prohibition Museum in the country? The American Prohibition Museum is an interactive experience that takes you through one of history’s most influential eras. Experience an hour of live actors in the most dapper attire, wax figures of the time’s most infamous personalities & plenty of vintage cars. After you’ve completed your tour, step into the fully-functioning bar, the Savannah Speakeasy known as Congress Street Up for a cocktail. Sip your drink in A.C. and watch the bartenders serve the patrons with flare. Sit back, relax and let nature keep you cool with the breeze that comes through large, open viewing windows on an Old Town Trolley Tour. For first timers to Savannah, this tour of such an historically rich city is a must. It’s a great way to get the lay of the land as entertaining and knowledgeable guides explain and point out just how Savannah grew, one of its 22 squares at a time, from the historic riverfront, where John Oglethorpe’s small colony was established on the Yamacraw Bluff 17 miles from the mouth of the Savannah River, to lovely Forsyth Park with its picturesque fountain. What’s even better, you can hop off and explore at many convenient stops and hop back on again for more touring! 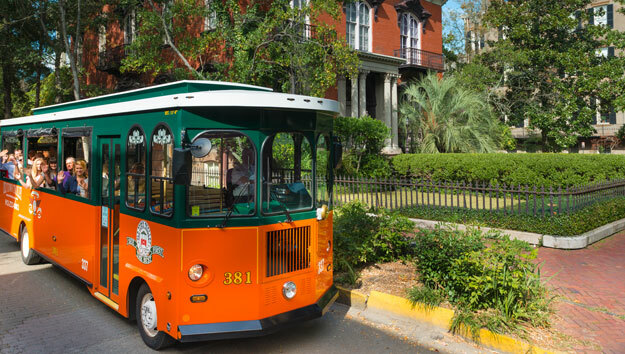 For at totally different tour experience, hop on a Segway for an up-close, leisurely, fun tour of Savannah. Segway’s are fun and easy. You’ll get the hang of it easily after a half hour training session. Then, off you go on a great gliding adventure. It’s a blast! 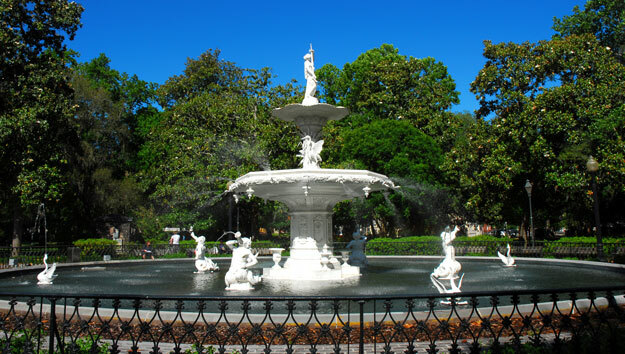 Savannah Segway’s Historic Tour of Savannah glides along tree-lined streets, around beautiful squares and parks and past wonderful architecture. For something really special, glide through one of Savannah’s most elegantly ornamented cemeteries on Savannah Segway’s Bonaventure Cemetery Tour. The Southern Gothic , mid-19th century rural garden cemetery , with its beautiful landscape and monumental stonework, is hauntingly beautiful and a must see, whether by Segway or on foot. Many local outfitters offering these specialized outings depart from Tybee Island. Check our such tours as Savannah Coastal Eco Tours, Wilderness South East Eco Tours, North Island Surf & Kayak, Bull River Cruises, Sundial Nature Tour, Moon River Kayak Tour, and Tybee Island Charters. These excursions are truly wonderful for any age. See Savannah from the river either inside in air-conditioned comfort, or cooled by the breeze on outdoor decks of a Savannah Sightseeing River Cruise. There are many options to choose from depending on your itinerary. Simply sightsee or choose to spend a dining experience on the water for dinner, Sunday brunch or a dinner cruise with rousing Gospel music. Or, head out on a Savannah Dolphin Watch Cruise to see forts and lighthouses on the way out towards Tybee Island in search of frolicking bottlenose dolphin. Skidaway Island State Park is 588 acres of nature trails shaded by palms and live oak veiled in moss and filled with wildlife from deer and raccoons, to graceful egrets and ospreys, to many forms of marine life. Nineteenth century Fort Pulaski is the place for history buffs and nature lovers. Walk through the fort to see moats, ramparts, tunnels and draw-bridges; look out over the expansive marsh and the Savannah River; walk the trails, keeping an eye out for bald eagles, peregrine falcons, manatees and loggerhead turtles. Head out to Oatland Wildlife Center where zoo meets nature. Experience nature along the trail through marshes and maritime forests or see them up close in spacious enclosures. Check out the schedule of Walks, Talks and Treks at Tybee Island Marine Center. Any one of these is a great time! For something different, try some of the really special, small, off-the-radar must see places. Intricately beautiful models of ships related to the history of Savannah on display at the small Ships of the Sea Museum. Tiny Pin Point Heritage Museum provides an enriching experience where the story of an important piece of Coastal Georgia’s cultural heritage unfolds in the community of fishermen established in 1890 by 100 freed slaves. Compared with the flash and dash of big city aquariums, University of Georgia Marine Education Center & Aquarium is small, unpretentious and interesting. Coastal Georgia’s marine life is exhibited in tanks of stingrays, mullet, jellyfish, pompano, horseshoe crab and more. Kids love the touch tanks, onsight guides enjoy explaining everything, and the boardwalk over the salt marshes is a treat.